Happy Memorial Day - Honoring "Murph" Together! It is a tradition within the CrossFit Community that on Memorial Day, we do “Murph”, one of the most well-known Hero workouts out there. Michael Murphy was graduated with honors from Penn State University. Instead of accepting an invitation to law school he accepted an appointment into the Navy’s officer candidate school. Just 3 months later he attended the Navy’s BUDS (Basic Underwater Demolition/SEAL) training in California. In July of 2002 he earned his SEAL Trident. In October 2002 he joined Operation Iraqi Freedom and spent time in Qatar and Djibouti before joining operation Enduring Freedom which is what the U.S. officially called the war in Afghanistan. On June 28th, 2005, Lt Michael Murphy, along with 2 other Navy SEALS and 16 American Special Operations Forces Soldiers gave their lives in support of their mission. Marcos Luttrell was the only surviving member of their squad and he has told the story of their sacrifice and bravery in the book, and now movie “Lone Survivor”. Murphy’s unit was assigned the mission of capturing or killing a known Taliban leader in the area. After infiltrating the area, they were discovered and surrounded by Taliban forces. During their firefight, even after being injured, Murphy left his place of cover to radio for help. Even after being shot several times he continued to fight and do everything he could to protect his men. Michael Murphy had plenty of options in life and he chose to do something he believed in to protect those who cannot protect themselves and serve his country with bravery and honor. He received the U.S Military’s highest honor, the Medal of Honor and his fellow SEALS who also perished in the battle, Danny Dietz and Axelson, received the second highest honor, the Navy Cross. 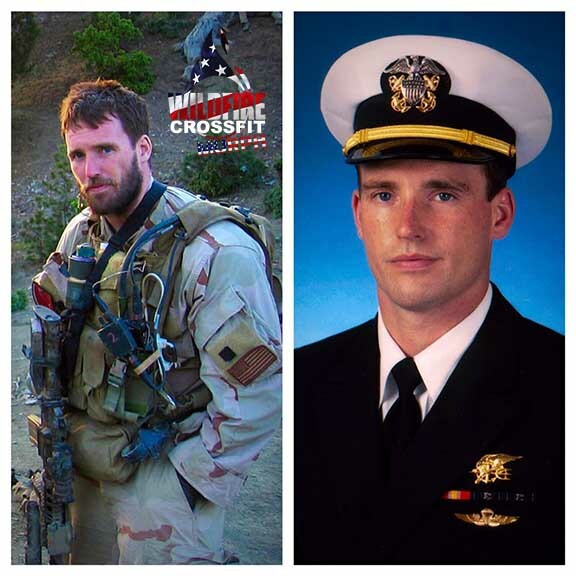 Both Dietz and Matthew Axelson also have CrossFit Hero WODs named after them. What is “Murph” really all about? When we do a hero workout such as “Murph” we are honoring the sacrifice that these brave men and women made. Hero workouts are a little bit longer, heavier, and all around more intense. These WODs also give us the ability to be there for the members of our team just as Lt. Murphy was there for his. We challenge each other. We push each other. We encourage each other to hold on and fight for one more, push, pull, step…rep. It is a workout experience that you will want to be a part of and while it may be one of the toughest workouts you have ever faced, you are not alone. I have never met anyone who was not thrilled they did it once it was all said and done. This is a chipper style workout that was one of Lieutenant Murphy’s favorites. He originally named it “Body Armor” and it was renamed in honor of his bravery. Can anybody do “Murph” on Memorial Day? YES! Any and all members of WildFire CrossFit can and should participate in Murph is some way shape or form. There are a few different ways we will allow this workout to be performed and it is up to you as an athlete to be smart in the way you scale this workout both up and down. The Rx version: When CrossFit originally posted this workout they mentioned that you can “partition” the workout any way you choose. However, since the first time we did “Murph” the “house rules” as well as the standard whenever this workout has come up in competition has been to complete the workout straight through. That means that once the mile run is completed, the athlete must complete all 100 pull ups before moving to push-ups, and all 200 push-ups before moving to air squats. The standard we will continue for the Rx version of the workout will be to start at the beginning and complete it straight through to the finish. However, we are going to make sure anyone who want to participate gets to take part in a challenging workout to honor the brave men a and women who sacrifice so much. Rx+ version: Straight through WITH a weight vest, body armor, sandbag, plate, med ball, or some other weighted object to raise the intensity. Just be smart, be safe, and have fun! One Final Note: YES…you can wear headphones for the entire workout. Just be aware of what is going on around you and remember that we are a team. If you see someone struggling, you can help to keep them going. If you are only doing this workout to get the fastest time possible then you are missing the point. So get ready everyone for Memorial Day Murph at WildFire CrossFit! Be ready to work hard, cheer on your team, and have some FUN! Classes at 7:30am & 9am, so get in early to get ready for the 3-2-1-GO!